I have been in the wonderful world of window washing for over fourteen years, and I have labored and persevered in honing my craft. I have a firm commitment to quality and detail, which comes from skill and experience. The lowest price will always be most appealing, but a poorly done job always costs more in the end. 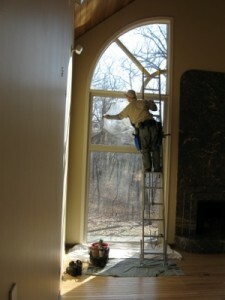 For larger window companies, they may employ ten or more people. 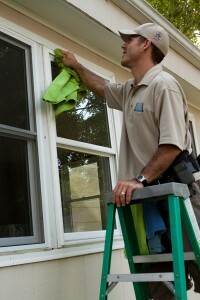 Instead of having the same window washer each time, you will have a different one. You will lack the strong business relationship, and may get someone who doesn’t know what needs to be done, or it may be his second week on the job. I will personally clean your windows each time, and I will be punctual. You will feel comfortable having me in your home, and will not need to concern yourself with whether or not I missed any windows. To protect you, the customer, as well as myself, I am bonded and insured. I am committed to giving you a great product with the highest quality I can offer, with integrity, and a professional attitude. I protect your floors, furniture, and walls from any drips, bumps, or scratches. I use a holster that attaches to my belt, to carry around my squeegee and washer. 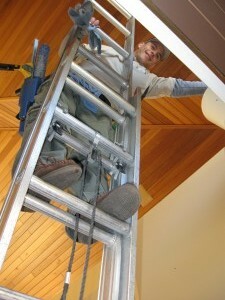 This prevents water spillage, especially when climbing a ladder in your home. Ladder mitts are used on the ends of extension ladders to protect your walls, and a drop cloth underneath to protect the floor. If you hire an inexperienced window cleaner who is cheaper, you may spend the money you saved to clean your carpet, or touch up paint on the wall. I guarantee my work, and your satisfaction. If you have any concerns or questions before, during, or after the cleaning, please let me know. In this way, you will not have to take a day off of work to have me come back. If anything needs attention, such as hard water deposits, I will let you know.